Find out which nursery furniture and baby cribs are most popular with other new parents and moms-to-be. Have you ever heard someone say they were "feeling blue" or "tickled pink" or caught "red handed"? We usually don't realize it, but society often associates colors into the way we speak or how we describe things because different shades of color evoke emotions and feelings. Every culture associates colors with different ideas and emotions, but the correlation is obvious, colors effect behavior, are used for symbolic significance and are utilized by everyone. When it comes to adding color(s) to your nursery, studies have shown that the variations of different colors have a powerful effect on behavior. The types of colors used should really depend on the type of ambiance you would like the nursery to have. 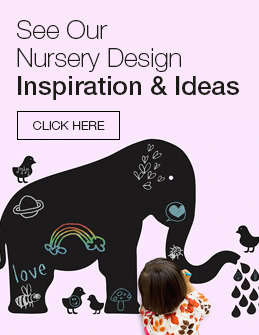 Do you want your nursery to have a calm, relaxing feel or have an energizing, stimulating environment? There are several factors to consider when it comes to choosing colors for your nursery and the most important ones are color type and intensity. Nursery colors can often be placed in two categories: Cold or Warm. Shades such as green, blue and purple are considered cool colors, versus orange, red and pink which are considered warm colors. So the first thing you will want to do is think about how you want your nursery to feel and that will help determine of you are leaning towards colors that are cooling or warm. Next, you will want to determine the intensity of the color, which will play a big factor as to how it will affect your baby's mood. For example, if you are feeling bold and decide to go with a fun color like red, be cautious of using too much of it because your baby is likely to become over stimulated and fussy. Instead, use red as an accent color and try pairing it with neutral or earth tones. On the other hand, if you decide to use a pastel, powder blue color, it will likely encourage a calming, soothing affect and therefore can be used more throughout the nursery. There are no rules as to which color variations work best, but this useful infographic on How Color Affects Your Baby will help explain how the different shades can affect your baby's mood, the symbolic significance of each color, and how to apply the various shades throughout your nursery. Learn about the most popular colors in the world and also read about color myths that are fun, but definitely false. Please include attribution to www.simplybabyfurniture.com with this graphic. Click to Enlarge or Download this image as a .pdf file for printing.